Whether you're looking for a ballerina-inspired tulle skirt or fun flower appliqués, get inspired by these aww-inducing dresses for your littlest attendants. 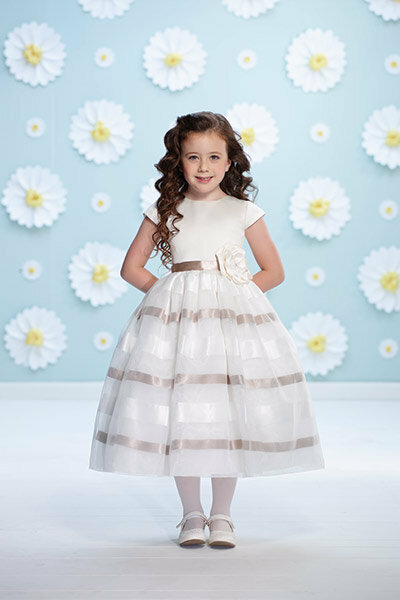 Satin and organza tea-length A-line dress with cap sleeves, large three-dimensional satin flower, and horizontal striped satin ribbon skirt. Sleeveless satin and tulle tea-length A-line dress featuring a hand-beaded bateau neckline and a satin tie back sash. Sleeveless satin and tulle tea-length A-line dress with hand-beaded jewel neckline and satin bow at the waist. Satin and tulle tea-length A-line dress with illusion cap sleeves and full box pleated organza skirt with lace appliqués. Organza over lace tea-length A-line dress with a bateau neckline and vertical and horizontal satin bands with flowers. Sleeveless taffeta and organza mid-calf length A-line dress encrusted with hand-beaded three-dimensional flowers. Sleeveless satin and tulle tea-length A-line dress, with a ruched bodice, beaded waistline, and multi-layer tulle skirt with wire edge. Sleeveless satin and tulle tea-length A-line dress with bateau neckline and hand-beaded bodice with pleated cummerbund. Venice lace, tulle and taffeta knee-length fit-and-flare dress with cap sleeves, dropped waist, and gathered tulle ruffled hem.